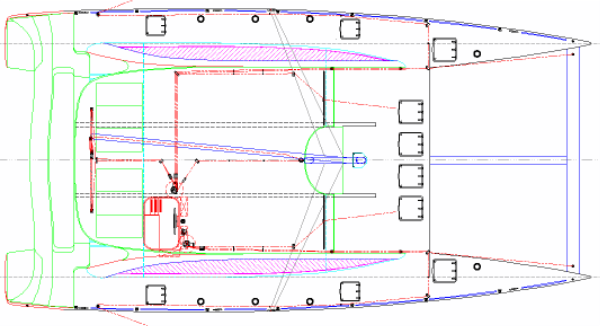 Alternative sail plan, with in-mast mainsail furling"
The DH550 Charter was commissioned as a custom-build project by a new charter group. They liked the DH550 but needed some major changes to layout and rig. The first boat starts construction in April 2018. See the DH550 for additional information about the base design. Guest accommodation in the hulls is in four equal double cabins, each with en-suite heads and shower stall. In the bow of each hull is a compact single crew cabin for use on crewed charters. The crew has a wet-heads (toilet and shower combined) at the foot of the steps in the starboard hull. That same area in the port hull is used as a pantry and location for the main freezer, freeing up space on the bridgedeck to allow a more compact galley. Bridgedeck saloon accommodation has give over some space to a larger cockpit, benefitting from moving the freezer and pantry down into the hulls. 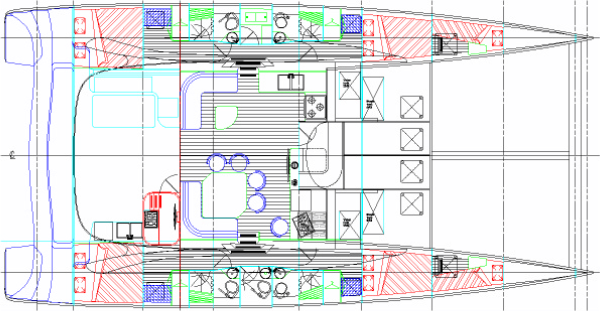 The rest of the saloon accommodation is comparable to the sister design but rearranged to suit the smaller floor area. The internal helm and control position has been retained but the helm in the forward cockpit has been removed. That cockpit has morphed into an unroofed outdoor social space, with seating and a table that folds out of the way against the bulkhead. The space stolen from the saloon has gone entirely to the aft cockpit, increasing the shaded outdoor relaxation space. It also has an outside galley, with cooktop, sinks and small refrigerator. Above the outside galley is an elevated aft working cockpit to replace the forward working cockpit of the DH550. This cockpit has helm and engine controls, with all sailing control lines led to two electric winches on the cabin roof. Halliards and reefing lines are kept at the mast but all other lines, including headsail and spinnaker sheets, go to the working cockpit. We have two rig options for this variant. 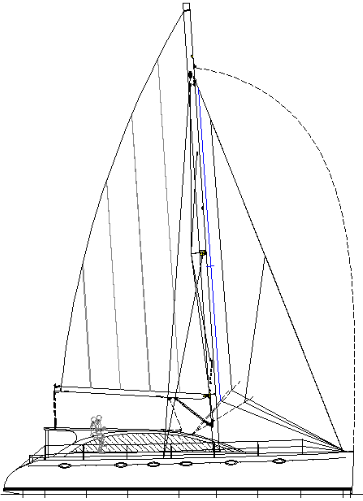 One is with in-mast furling mainsail and moderate roach supported by vertical battens that roll away with the sail. The other has a large roach that is supported by horizontal battens, with slab reefing. The boom is longer, sheeting to a track at the aft end of the roof. The sheet runs forward inside the boom, then down to the front of the cabin roof before running aft to the helm cockpit. Headsails sheet to transverse tracks on the front edge of the cabin roof. 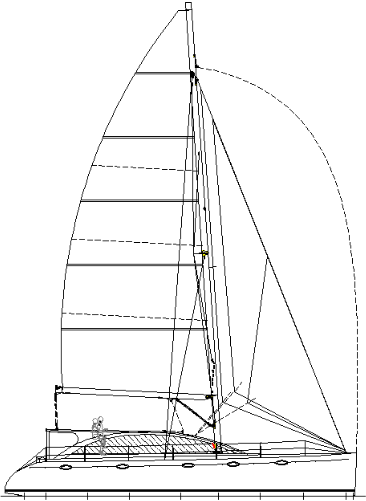 The asymmetrical spinnaker sheets to the quarters, with both foreguy and sheet led along the cabin roof to the aft helm.